Today I headed up the Saddle Road from Hilo because the weather was lousy down in Hilo, with shower after shower rolling in on the trade winds. 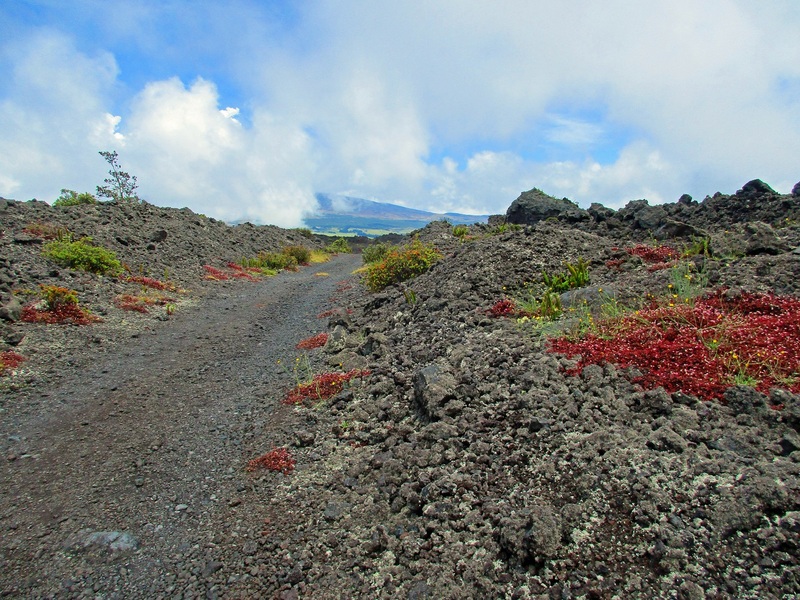 I hoped to get above the weather by hiking at almost 6000 feet elevation on an old Cattle drive trail between a ranch up here and the southern part of the island. 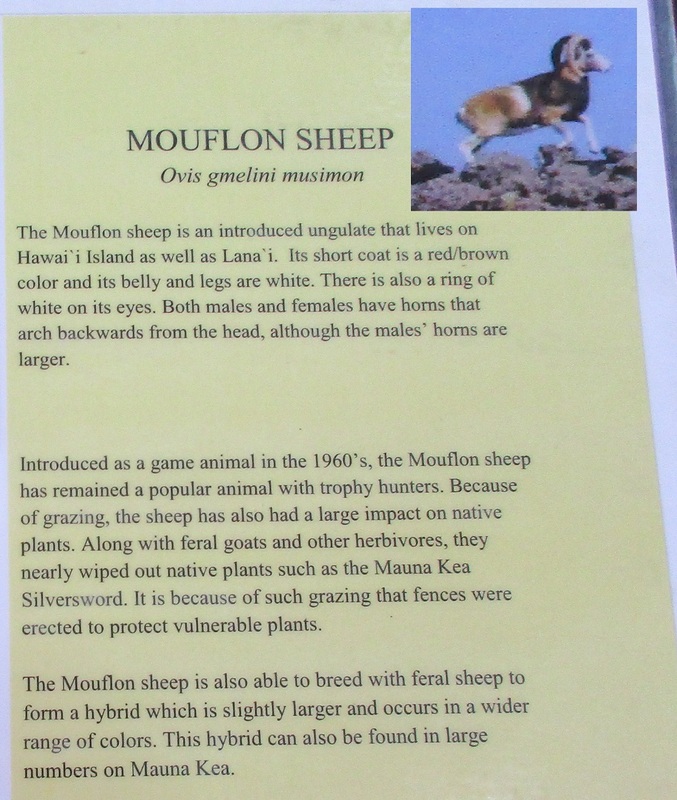 The ranch and the trail are called Pu'u O'o. A pu'u is a hill, specifically a cinder cone. 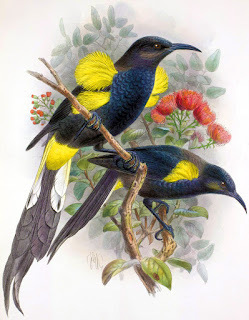 The 'o'o is an extinct Hawaiian bird whose strikingly brilliant yellow wing accent feathers were used to make ceremonial robes and capes ands staffs for the king and nobility of the native Hawaiians. They carefully conserved the species by catching the birds live, plucking feathers, and then releasing them. Europeans came and slaughtered them to extinction within a few decades in order to add the stuffed birds to their collections and to sell as caged birds that rarely lived a week. I'm native European and my shame knows no bounds. Last known sighting of the poor 'O'o bird was not far from where I hiked today, back in 1934. 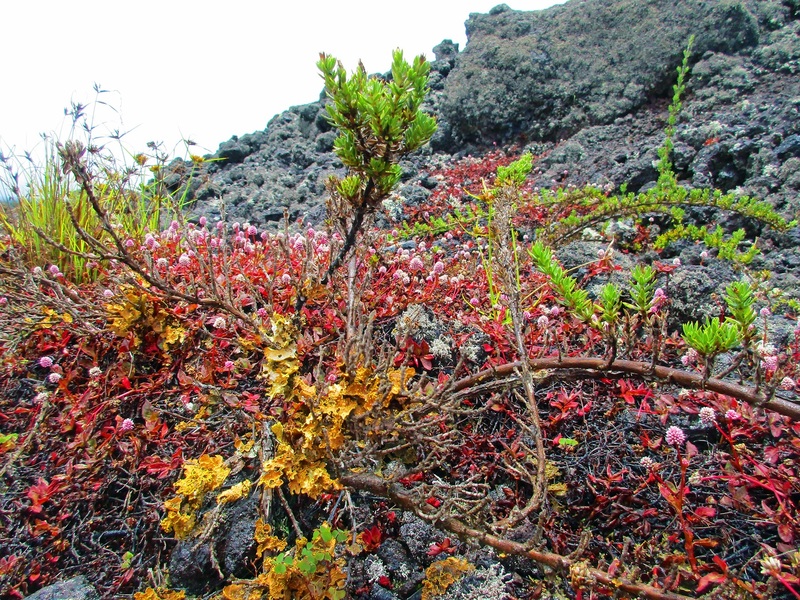 Also shown in the above 1893 drawing by J. G. Keulemans is the bright red flower of the 'O'hia Lehua tree, also shown growing as a shrub amid the lava along the trail in the headline photo above. According to Hawaiian legend, 'O'hia was a most handsome man. He and his young lover Lehua were out strolling alone one evening. The volcano goddess Pele herself approached 'O'hia, making advances to him, but he rejected her. In a fit of rage Pele turned 'O'hia into a tree. 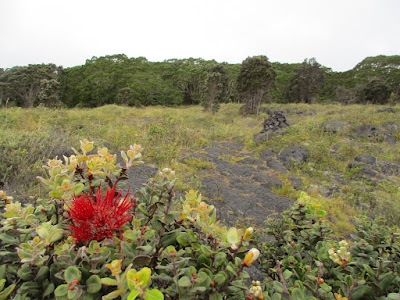 Young Lehua was reduced to tears and inconsolable, and Pele instantly regretted her act. 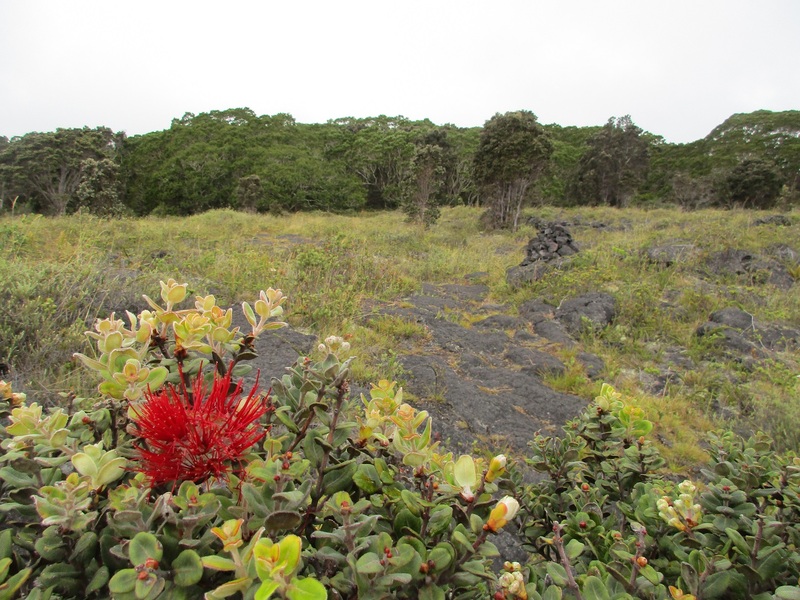 But she was unable to reverse it, so instead she turned Lehua into the beautiful red flower that is forever adorning her lover's branches. The 'O'hia tree is not a threatened species. 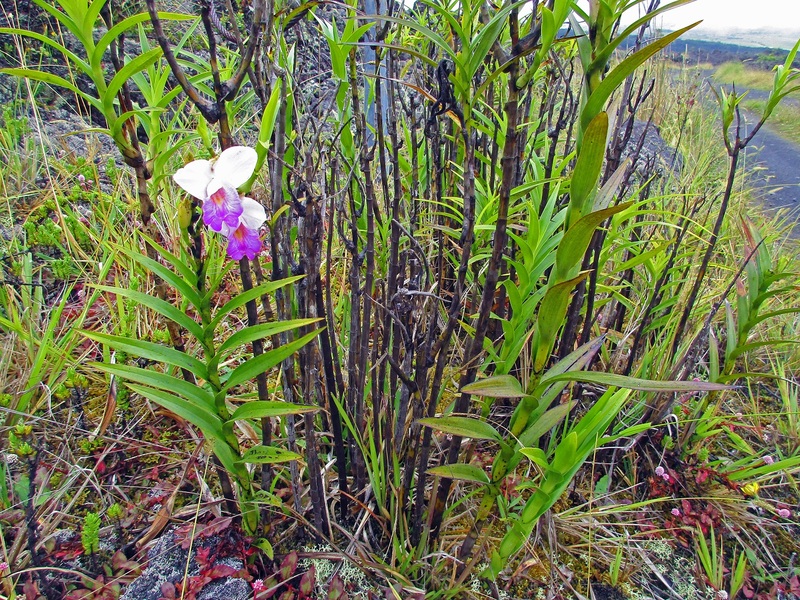 It's everywhere in Hawaii; it's not picky about climate or soil conditions, thank goodness. 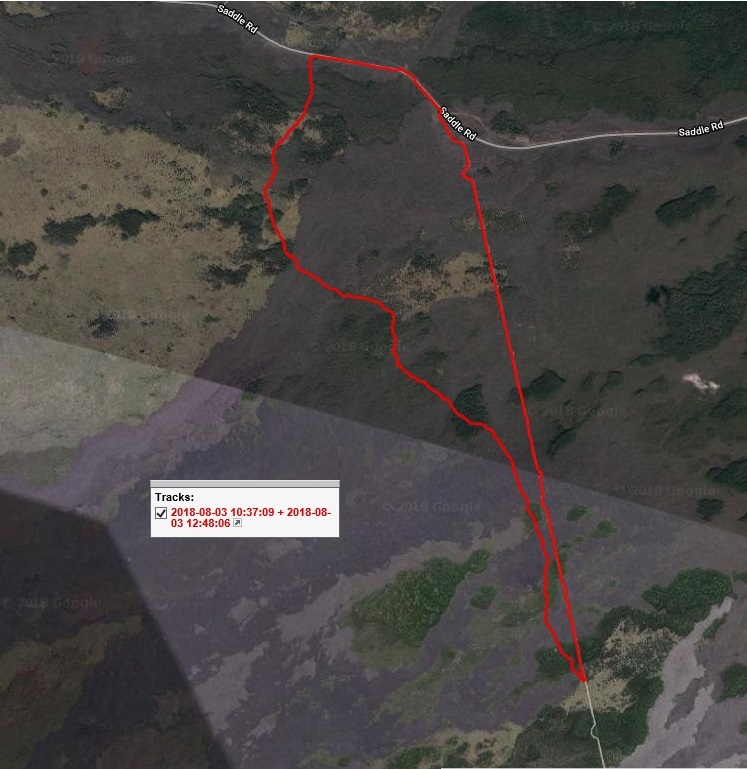 The Pu'u 'O'o trail loop that I hiked today is about 9 miles. 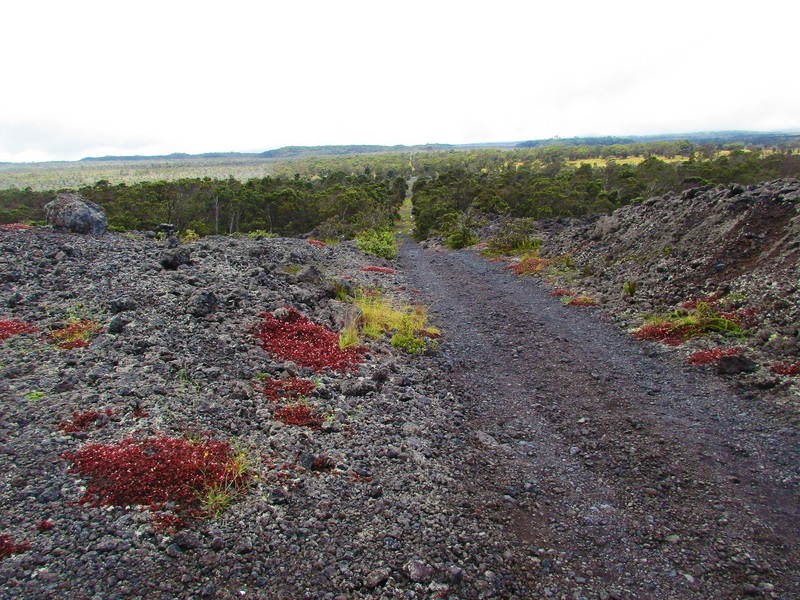 It follows a route through recent lava flows interspersed with Kipuka--islands of old growth forest that were spared by the lava. One can be seen in the distance in the headline photo. 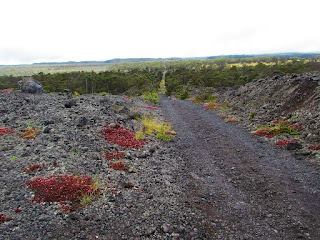 When crossing the lava, the trail is marked by big, well-built Ahu - what we call Cairns on the mainland. One of those is also shown in the photo. Now for the drama. 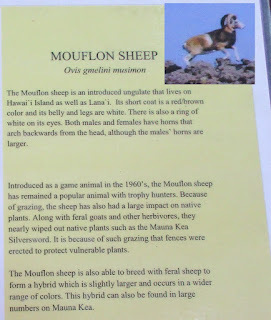 About a mile into my hike I saw one of these colorful sheep with big curving horns. I couldn't grab my camera quick enough, and it scampered away into the trees. Turns out that this is a European introduction, brought in by the game hunters to enhance their experience. Not ten minutes later it began to rain. I had been suckered into thinking I was above the rain by the benign conditions I found when I got to the trailhead. For the next seven miles I was marching along in heavy rain and fog and mist and strong wind, huddled under my trusty Go-Lite umbrella. When hiking in Hawaii (except perhaps on the Kona side), if you don't carry your umbrella with you then you're a certifiable Loon-ball. 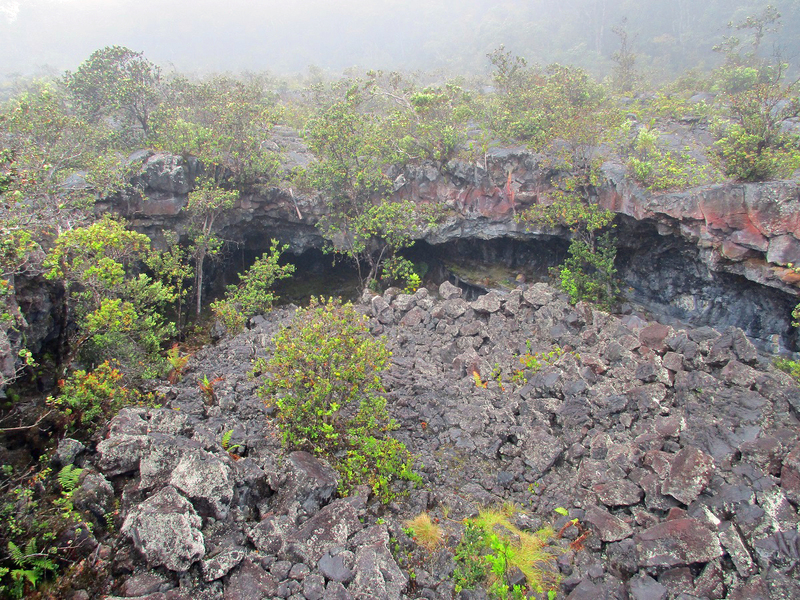 When I got to this pristine cave--an old collapsed lava tube called Emesine Cave, which you have to have a permit to enter--the weather was beginning to let up, but you can get a sense of the dreary conditions. I had finished the foot trail portion and was hiking back toward the Saddle road on a 4x4 track that was probably the more recent version of the cattle-drive route. Finally there were a few moments of sun and I caught a glimpse of some of the majestic sights I was missing--here a look at the slopes of Mauna Kea. Here's a look back toward the south from the same spot. 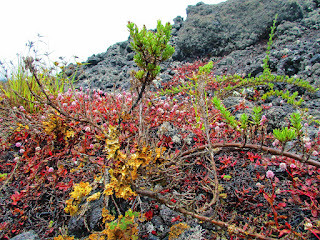 I had a chance to appreciate the odd varieties of vegetation and lichen that habitate the jagged 'A'a lava flows--don't fall while hiking around 'A'a. You'll be cut to shreds. 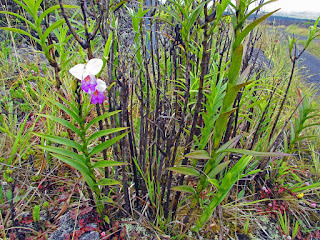 Even here in this semi-cool harsh climate there were wild native orchids with amazingly delicate blooms. The breezes quick-dried my pants as I returned to my car. Fifteen minutes later it was pouring down rain again. Here's my hiking route superimposed on the Google satellite image. You can see the various types of ground cover that the trail traverses. The green patches are the Kipuka. 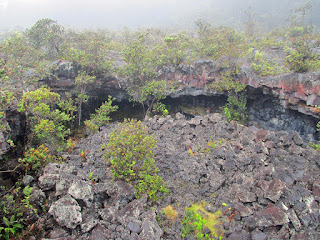 The darkest black are the razor-sharp fractured 'A'a lava flows, and the gray is the smooth Pahoehoe lava. 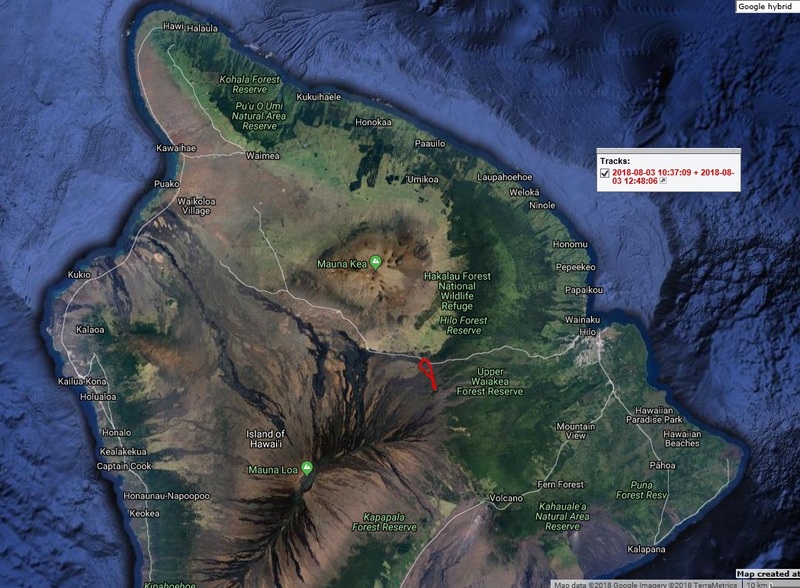 And for context, here's a wider view of most of the island with the track located near the center.